For fighter info, see Ryu (SSB4) and Ryu (SSBU). Official artwork of Ryu from Street Fighter V.
Ryu (リュウ, Ryu) is the main character from the Street Fighter series of fighting games by Capcom, and one of that company's most famous mascots alongside Mega Man. He was first leaked as a downloadable content character for Super Smash Bros. 4 through datamining of the 1.0.6 update alongside Roy, and was confirmed on June 14, 2015. Ryu is considered to be the "main character" of the Street Fighter series. Appearing in all Street Fighter games, Ryu's moveset is designed to be simple and beginner friendly, with a projectile and an anti-air move. Over the years, due to his simple play style, he has received many clones, including Ken and Akuma. Orphaned at a young age, Ryu was raised and trained by master Gouken in the art of Ansatsuken, the Assassination's Fist. Gouken would later take on a second pupil, Ken Masters. Ryu and Ken became best friends and rivals as they trained together and eventually left Gouken's dojo. After leaving, Ryu entered the first World Warrior tournament, hosted by Sagat, the self-proclaimed King of Muay Thai. Ryu advanced through the tournament, and eventually came face to face with Sagat himself. The older Sagat nearly bested Ryu, but was defeated when Ryu was overcome with the desire to win, and thus opened himself to the Satsui no Hadou (the Surge of Murderous Intent), a force that grants its user great strength but slowly erases their humanity. This gave Ryu a second wind, and he took Sagat out with a powered up Shoryuken, which would leave a large scar across Sagat's chest. Around this time, Gouken was murdered by his brother Akuma. Learning of the murder from Ken, Ryu traveled the world to search for Akuma. Upon confronting each other on a Japanese island, Akuma tried to persuade Ryu to give into the Satsui no Hadou as he had done. Ryu refused, and Akuma destroyed the island, leaving Ryu stranded. Ryu then sparred with Ken, who realized that his friend was not himself, and gave Ryu his red hairband as a reminder to stay focused. Ryu was also approached by a young fan of his named Sakura Kasugano, who asked him to take her on as a pupil. Ryu declined, believing he had much to learn himself. Ryu also had a rematch with Sagat, who longed for nothing more than revenge for the humiliation he was put through at the World Warrior tournament. Ryu quietly threw the fight, since Sagat had still not fully recovered from their last fight. When Sagat learned this, he vowed to fight Ryu again. Two years later, Ryu was kidnapped by M. Bison of the Shadaloo syndicate. Bison wished to learn the secret of the Satsui no Hadou to further his own ambitions, and brainwashed Ryu. Ken, Sakura, and Sagat arrived to rescue Ryu, and Sagat fought him once again. Realizing the lengths he had gone to just to satisfy his revenge, Sagat, who was Bison's right-hand man at the time, managed to restore Ryu to his senses, and he defeated Bison. Dee Jay, a Jamaican kickboxer and musician. It is not known how far Ryu advanced in the tournament, but his ending shows him winning the tournament, and quietly leaving before the awards ceremony in order to get back to training. Later Street Fighter II editions also feature Ryu visiting Gouken's grave in his ending. Adaptations in other media depict Ryu advancing to the end of the tournament, but his fight with Bison is interrupted by the arrival of Akuma, who seemingly kills Bison and challenges Ryu to another duel. A year or so after, Seth, the CEO of a mysterious weapons organization known as S.I.N (later revealed to be the weapons division of Shadaloo), theorizes that harnessing the energy of the Satsui no Hadou will allow Seth to complete the BLECE project, a bio-weapon being researched and built by S.I.N at the time. He makes multiple attempts to lure Ryu out, many involving his subordinate Crimson Viper (who is an actually an undercover CIA agent), but the power of the Hadou proves to be too strong for Seth and the machines, even as Ryu attempts to contain it. Seth then announces another fighting tournament in the hopes of bringing out the Satsui no Hadou by other means; however, this was revealed to be all part of a plan set out by Shadaloo and its leader, a revived M. Bison, and M. Bison proceeds to take out Seth and take over S.I.N once again; this allows Ryu and Sakura to help destroy what's left of the S.I.N laboratories. During the tournament, Ryu and Ken learn that Gouken survived his encounter with Akuma by emptying his soul with the Power of Nothingness (Mu). About three years later, Ryu has resumed training with Gouken in order to achieve control over the Satsui no Hado, or at least keep it in check. He is encountered by a few new challengers, such as Brazilian Jiu-Jitsu practitioner Laura Matsuda and Middle Easterner adventurer Rashid. Notably, he narrowly wins his fight against Rashid due to unwillingly tapping into the Satsui no Hado; even though Rashid is grateful for the match and holds no grudge against him, Ryu takes this as a sign that he must keep training to control himself. In order to do so, he seeks out Dhalsim for answers, when he is attacked by Necalli, a mysterious warrior bent on devouring powerful souls, such as Ryu's own, infused with the Satsui no Hado. Ryu is only saved thanks to Dhalsim's timely intervention. At the same time, Shadaloo sets in motion Project C.H.A.I.N.S., a master plan designed to strenghten Bison's Psycho Power to unimaginable levels by filling the world with fear, despair and hatred, negative emotions on which Psycho Power feeds. While this is happening, Ryu undergoes an isolated training regimen and finally, during a rematch with Necalli, manages to purge the Satsui no Hado completely from his body and soul by finding his own Power of Nothingness. He then joins Ken, Chun-Li and other fighters under the leadership of young Japanese entrepreneur Karin Kanzuki for a final assault on Shadaloo, in order to stop Bison and Project C.H.A.I.N.S. By using the Power of Nothingness, Ryu is able to defeat Bison once and for all, as the dictator's body breaks apart, unable to contain the overwhelming clash of powers. However, the rejected influence of the Satsui no Hado manifests itself as a corrupted copy of Ryu. The copy, calling itself Kage, confronted Ryu in the hopes of taking over his body, but Ryu's Power of Nothingness is able to banish it. After he, Chun-Li and Guile escape the crumbling Shadaloo base, Ryu goes back to his training, feeling his journey to self-discovery through martial arts is yet to continue. In this capacity, he goes on to meet a host of new fighters during his travels, such as the hermit and Senjutsu master Oro, who sees great potential in Ryu. Sometime afterwards, Ryu enters the third World Warrior tournament to further advance his fighting abilities. His most notable fight during the tournament is against Hugo, who is able to withstand his Shin Shoryuken and hold his own. He continues his travels afterward, meeting Oro along the way. Ryu ends up being defeated by Oro who likes him to be his successor. He was later seen in Oro's ending, being trained by him but Ryu is unaware of Oro's presence as he only heard his voice. Shortly after the tournament, Ryu meets up with Ken for a friendly match in the latter's storyline, from which he emerges the victor. Ryu later fights against Sean who has been asked by Ken to fight him. Ryu easily defeats him from time to time with just a single Hadoken as he noticed his actions. Ryu also serves as Hugo's pro-wrestling tag-team partner for a brief period of time before moving on, also shown in Hugo's storyline. At some point, he encounters Alex, an American wrestler whom he solidly defeats. Ryu encourages the young wrestler to continue honing his abilities against strong opponents. Fascinated by Ryu's skill and determined to become stronger, Alex soon sets out to find Ryu for a rematch. In his ending, Ryu is under a waterfall practicing his mind and body. He mumbles about the meaning of a true warrior, why he needs to be strong and reminisces his youthful days. A single leaf falls over him and he crushes the leaf with his left hand. Ryu believes that as long as his strong opponents and some fierce battles will excite him, he will possess the strength to move even one of his fingers and decides to keep on fighting. Ryu as he appears in Super Smash Bros. 4. 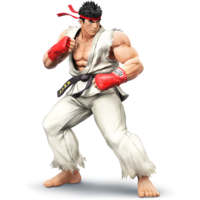 Ryu appears as downloadable content in Super Smash Bros. 4, being the first newcomer and third-party character with that distinction. He is also the second Capcom character to be introduced to Smash, the other being Mega Man. His design and aesthetics are largely based upon Street Fighter IV. Ryu possesses unique mechanics that emulate controls in his home series, such as tapping the attack button for weak attacks and holding it down for strong attacks, along with special directional inputs he can use to power up his signature special moves, Hadoken, Tatsumaki Senpukyaku, and Shoryuken. Finally, his down special Focus Attack allows him to negate a single attack and retaliate with a crippling blow, leaving opponents open for counterattacks, or cancel the move into movement options. Currently, Ryu is ranked 11th of 55 on the Smash 4 tier list (tying with Marth), placing him at the bottom of A tier. While he lacks in approach options and grab combos, his tier position is mostly due to the Street Fighter controls benefiting Ryu immensely when mastered, granting him true combos into his finishers that many other fighters lack, along with a resilient recovery using three of his four special moves. Ryu visits from the Street Fighter series! Ryu’s fighting style is based on karate, but he’s mixed in some other martial arts to make his own unique style. In Smash, he will perform either weak or strong attacks depending on if you press or hold down the buttons. His special attacks also have three power levels! Ryu makes his Super Smash Bros. debut! His fighting style is based on a form of karate, but he's mixed in some other martial arts to make his own unique style. Here his attacks can be weak or strong depending on whether you press or hold the buttons. Each of his specials have 3 levels of power using the same method. Ryu’s Focus Attack move lets him withstand a blow and then counterattack.The longer you hold it, the longer your enemies will be stunned if you hit them. If it hits a standing enemy, the enemy will become defenseless. When that happens, cancel your Focus Attack and unleash a sick combo! Ryu's down special, Focus Attack, allows him to withstand a single attack and then unleash a counter. The longer you hold the button, the longer a standing enemy will be stunned if you hit them. An enemy in the air will fall slowly, defenceless. When that happens, cancel the Focus Attack and go for the knock-out! Ryu as he appears in Super Smash Bros. Ultimate. Ryu returns as a playable character for the second time in Super Smash Bros. Ultimate, this time as an unlockable character. With Ryu's release, Capcom became the first third-party company to have more than one playable representative in Smash, the first Capcom character being Mega Man. Coincidentally, the release date of Ryu in SSB4, June 14th, is the birthday of his English voice actor, Kyle Hebert. Ryu's English voice actor portrayed Wario in the Super Smash Bros.-based webseries There Will Be Brawl, which also featured Matthew Mercer (the voice of Chrom). Coincidentally, Kyle Hebert would later appear in WarioWare Gold as the English voices of Dribble and Dr. Crygor. 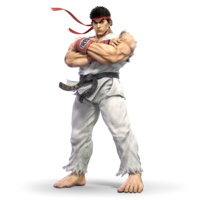 Ryu is the first Smash Bros. character to originate from a traditional 2D fighting game, as well as any other kind of fighting game apart from the Super Smash Bros. series. 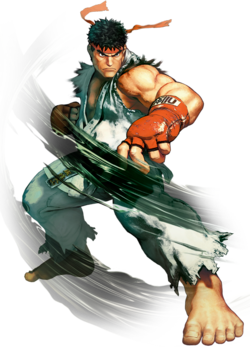 Ryu is the first third-party character to originate from a fighting game, and the second overall. The Super Smash Bros. series marked Ryu's sixth appearance in a crossover fighting game series after the Marvel vs. Capcom series, Capcom vs. SNK series, SNK vs. Capcom series, Tatsunoko vs. Capcom series, and Street Fighter X Tekken. Ryu has appeared alongside several Smash characters in games outside of Smash 4 and Ultimate. Ryu regularly appears together with characters from the Mega Man universe, including Mega Man and his variants, in Capcom's crossover games such as its Vs. series. Ryu appears alongside Pac-Man in Street Fighter x Tekken (along with a parody version of Mega Man based on his appearance on the box art for the original Mega Man). Ryu cameos along with Bowser, Sonic, and Pac-Man in the Disney film Wreck-It Ralph and he and Sonic returned in the film's sequel, Ralph Breaks the Internet. Ryu appears in the "Worlds Unite" comic book crossover series which stars Mega Man and Sonic. Ryu appears as a playable unit alongside X, Zero, Chrom, Lucina and Fiora in Project X Zone 2. Ryu and Sonic both have costumes based on them in LittleBigPlanet. Ryu, Sonic, and Cloud have costumes based on them in LittleBigPlanet 2. Ryu and Sonic both appeared in the film Ready Player One. This page was last edited on April 2, 2019, at 23:54.